There’s a range of effects designers often need to produce in their artwork. Watercolour effects, sketched effects, printed effects and illustrated effects are examples of popular styles that can take considerable amounts of time (and skill) to create manually using traditional tools. Thankfully there are time saving kits that allow us to produce realistic effects without the hassle or the mess. 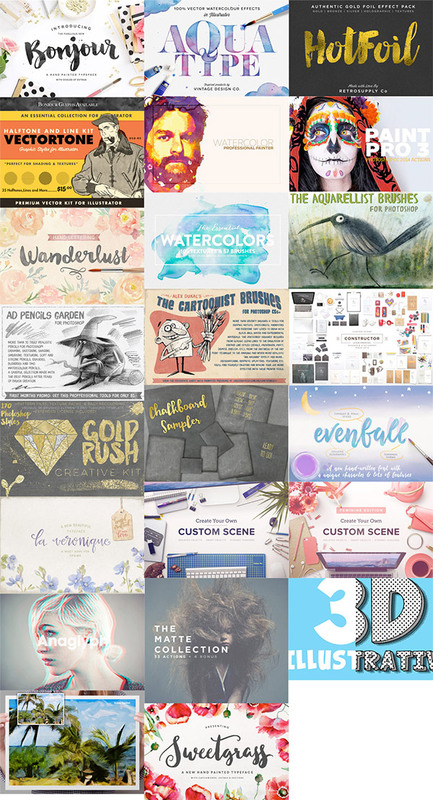 A wide selection of these kits have just become available in one complete bundle over at Design Cuts; The Beautifully Artistic Designer’s Kit contains 23 best selling premium resources that help you create stunning artwork with ease. Photoshop Actions, Smart PSDs, Vectors, Textures and Brushes are just some of the items that make up this entire bundle. 23 best selling premium design products have been combined to produce an all-in-one kit that helps you create a variety of popular design styles. Any effect that leaves you thinking ‘I couldn’t create that!’ or ‘it would take me absolutely ages to create that!’ can be easily achieved with these superb resources. Here’s an overview at some of the coolest results these resources can generate in seconds. Creating watercolour effects has never been so easy with the resources included in this bundle. There’s a great mix of products that produce colourful effects in both Photoshop and Illustrator, combining Actions, brushes textures and graphic styles to cover every scenario. If you’re a Wacom tablet user these packs of Photoshop Brushes will transform your digital paintings into realistic hand drawn art. 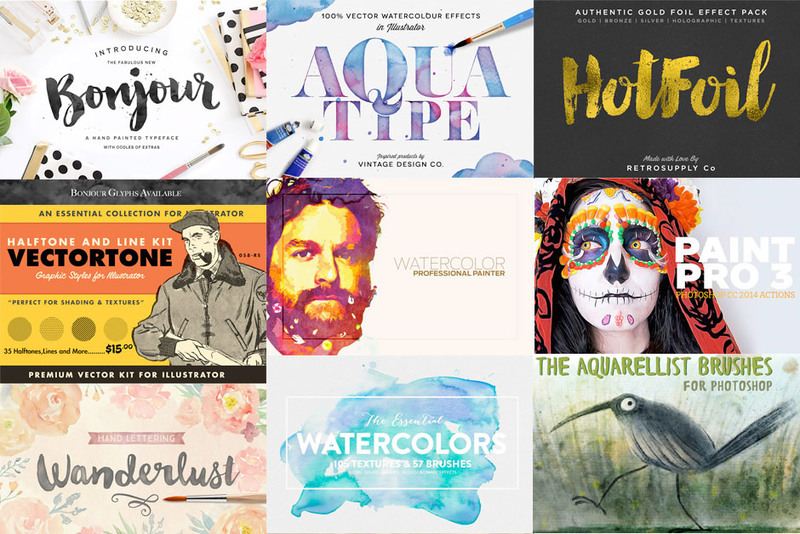 This bundle contains loads of sketched, painted and inked effect brushes that are all professionally created to take advantage of the virtues of your Wacom tablet. Hand lettering is one of the most popular and sought after styles at the moment but it requires a high level of typography skill to produce these designs. That’s without the use of these fantastic hand lettering kits that combine script fonts with additional textures and vector resources that help you easily create realistic hand lettered art of your own. Now you’ve created your stunning designs with realistic artistic effects, how do you show them off to the world? How about with a custom scene builder that allows you produce trendy tabletop scenes in seconds? These PSDs contain more mockup elements than we could ever source ourselves, so they complement lots of different design styles. The full Beautifully Artistic Designer’s Kit contains even more premium resources that I haven’t even mentioned in my review. Check out the full overview to see the vast array of items this bundle contains. The discount of 91%, reducing the cost of all these resources down to $29, and the inclusion of extended licensing are the two key features to note. This licensing allows you to use these effects in your personal and commercial work, even designs you intend to sell as prints or merchandise. This honestly is a no brainer for me as a beginner. Thank you for sharing! I hope it comes in handy for you in future projects, Kassandra! Awesome share, these are really great. Love the styles. Thank you Teelah, I’m really happy you like the selection.